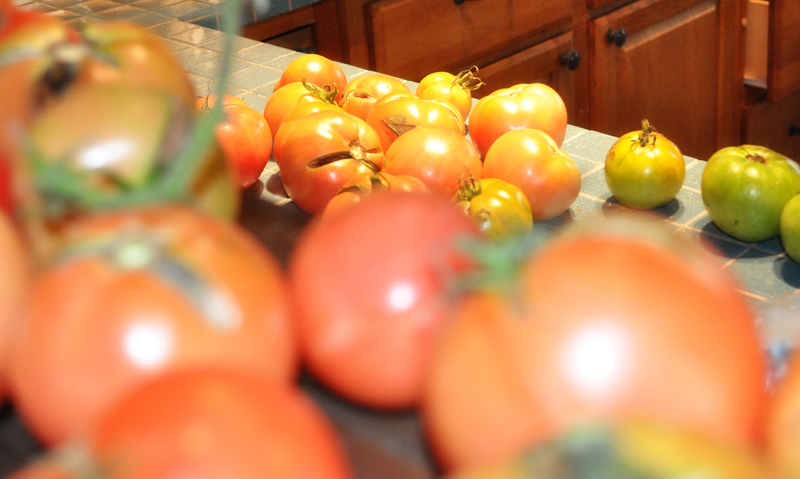 Tomatoes… need I say more? I have to do a tomato update. 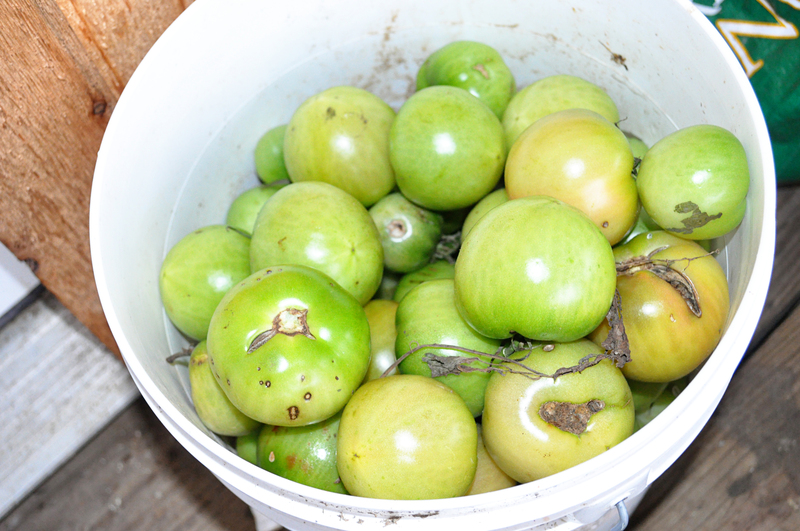 Last week I picked all the tomatoes left on our plants. The weather man predicted a plunge in the morning temps, inciting my last surge to denude the plants. Of course, this had been anticipated. Tomatoes can’t stay on the vine much farther into the fall. 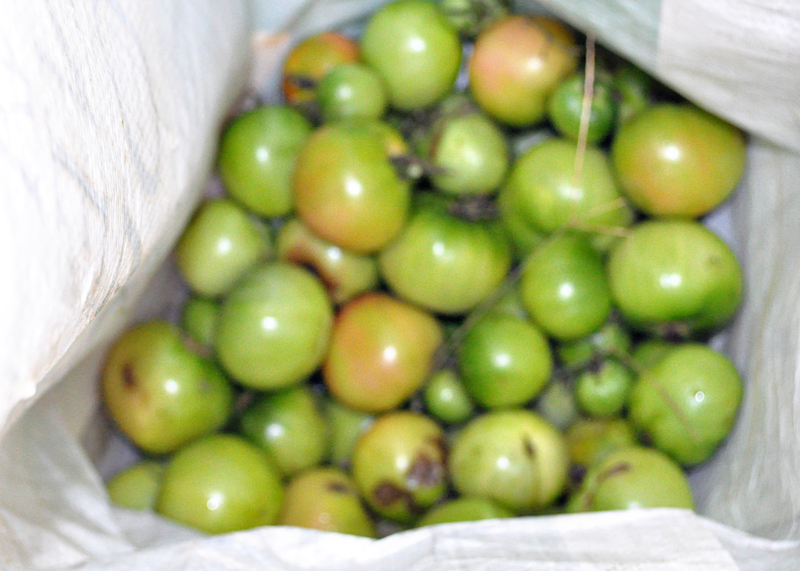 But still, November 29 is an outstandingly long time to keep fruit on the plants… you have to admit. 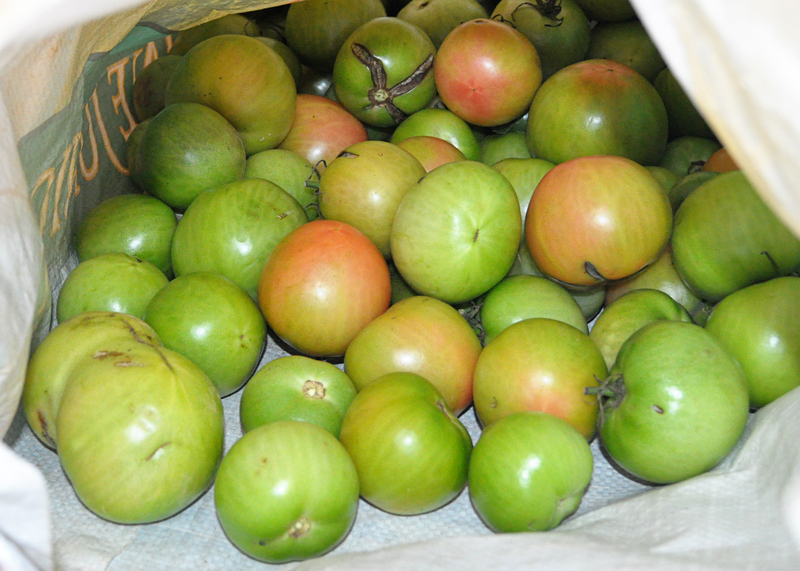 So… last Tuesday, before my work nap, I spent an unexpected two and a half hours picking tomatoes off all of six, mind you only six, plants. 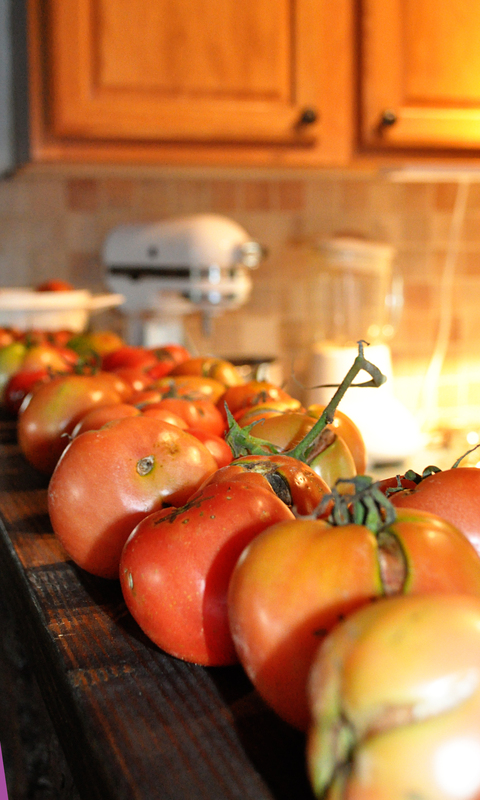 I kid you not when I say I pulled at least sixty pounds of tomatoes off those darned things. And my muscles felt every one of them the next day. At first I filled a five gallon bucket. After trudging that thing back to the house, I decided empty feed bags would work well. I filled the bottom of one of those. After almost breaking my back to drag those two back to the house, I smartened up and pulled out my garden wagon and filled the remaining two bags. These held the largest tomatoes. Thank goodness for that cart. After bending to the task for two hours, my strength waned. I barely pulled that heavy cart back to the house. 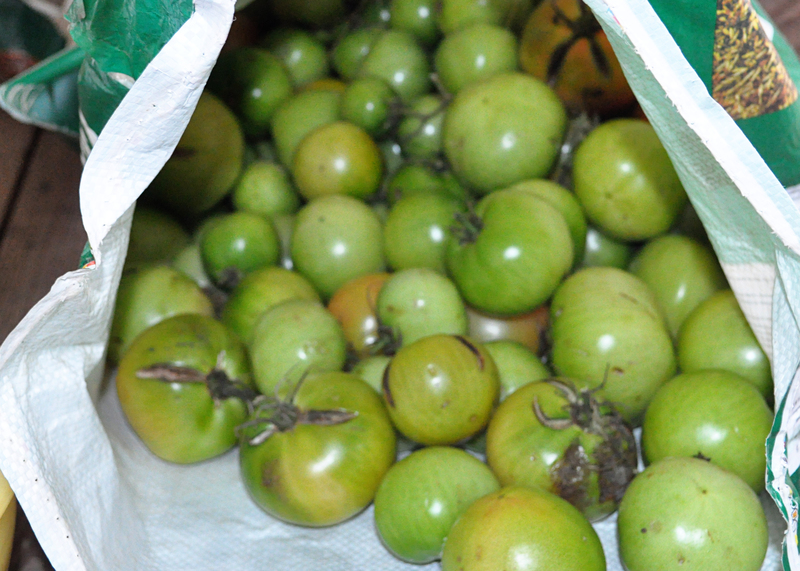 But I had a mother load of tomatoes. Some of those ripened and I canned them this weekend. Don’t pay any attention to the blemishes… please. They are cut off before I cook them. These few tomatoes filled six quarts!! They don’t look like that many, but boy do they multiply. One last look at the bounty. 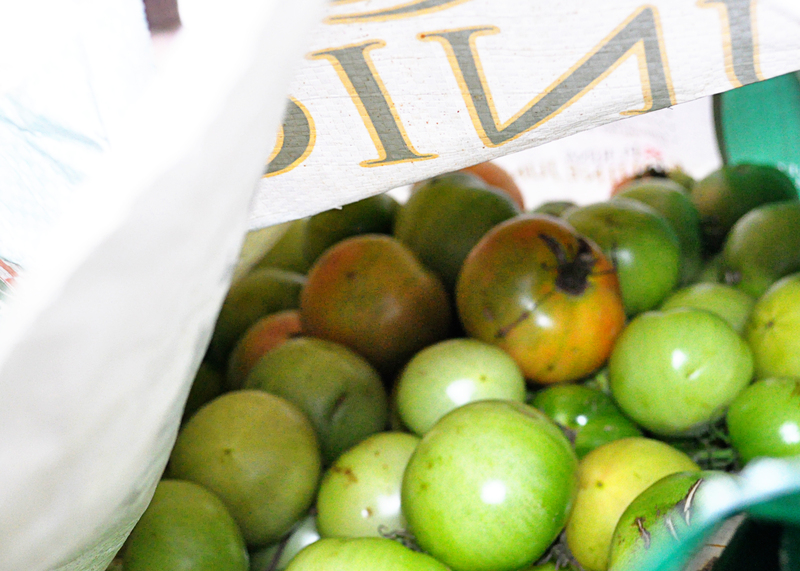 Now picture all those tomatoes in those bags as red and juicy. I estimate a couple dozen quarts before the winter is through. Not too bad for a fruitless summer. That is my little piece of heaven today. Thank you for stopping by. I’d love to hear what came out of your garden this year. We did well with tomatoes this year but got the bumper crop of squash off 3 hills of acorn squash. We picked 56 squash! And then found 3 more hidden under a few (gasp!) weeds. This was in lower central Michigan. Wow!! That is awesome! I love acorn squash. It’s with great pleasure and joy I have been following your efforts with your tomatoes. Growing tomatoes is one of my interests as well. My darling husband and I have a summer paradise in northern Sweden, where we try to live as self-sufficient as possible in terms of vegetables, fish, mushrooms and berries. The climate, though, is not always on our side and it’s not always our harvests have time to mature before frost. But getting our little greenhouse made all the difference and we have been able to pick ripe tomatoes most of the summer now and way into the autumn. What hasn’t been consumed on a daily basis I’ve turned into tomato marmalade, delicious with goat cheese or camembert. If you look through my blog you probably won’t understand much of what I’m writing, but if there’s anything that catches your interest, please let me know and I’ll gladly try to explane or translate. 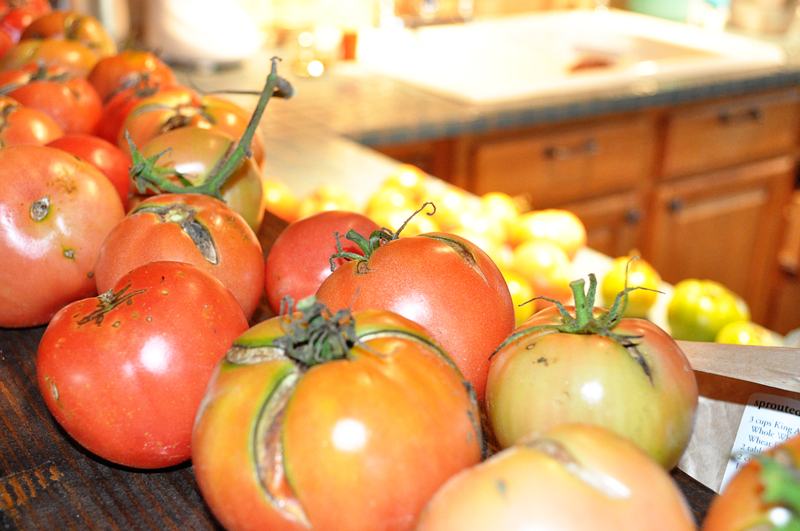 i can’t get over how many tomatoes you picked from 6 plants….that manure really did the trick!!! !…i know you were exhausted after all that work!! !…i am beyond impressed!! !